The event takes place on the 23rd of January starting at 20:00. 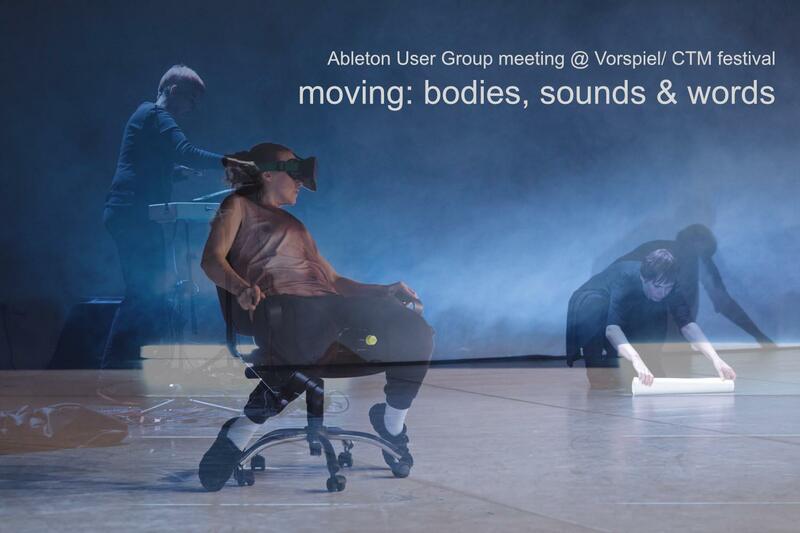 This Ableton user group Berlin meeting is part of Vorspiel at CTM festival and will focus on different aspects of interaction of music, dance and spoken words. Thordis Meyer, Mila Chiral and Donna Maya will talk about different approaches of how to connect those art forms, demonstrate their workflow (with Ableton Live) and how they build up their live setups. Afterwards, Mila Chiral and Donna Maya will play an excerpt of their work “Blickfang / Blick-Fänger” and Thordis Meyer will present parts of her performance “Now or never? However!”. The performance „Blickfang/ Blickfänger“ navigates between the presence of the poem „Sphinx – Hinter Gittern“ (Sphinx – Behind Bars) by Anne Duden, the interventions of Donna Maya with the theremin and electronic sound compositions interwoven with speech samples, and the dance and live video of Anja Weber/Mila Chiral. “Blickfang / Blick-Fänger” was produced for drei D poesie, a project of Haus für Poesie, Berlin. Maya Consuelo Sternel, a.k.a. Donna Maya, is a Berlin based musician, composer and producer of electronic music as well as the first female Ableton certified trainer and organizer of the AUGB. She plays Theremin and combines it with noisy textures and multi-layered sounds, wrote film music for Fatih Akim’s film “Kurz und Schmerzlos”, composed turntable concerts for chamber philharmonic and DJ and released vinyl records and CDs internationally on various labels. Anja Weber, a.k.a. Mila Chiral is a dancer, choreographer and producer of electronic music from Berlin who works in composing sounds and poetry as well as bodies and movements in time and space.. In 2017 she released her first solo album “Where Time Meets Space” on Elestial Sound. In the lecture performance “Now or never? However!, Thordis Meyer will present her recent works, in which both the voice and the human body become dancers, and so does a car … But the truth is: Thordis has only one thing in mind – to finally become a pop star. But how if not never? However! A participatory presentation between basses and melancholy. In Thordis Meyer’s performances, the (maybe) autobiographical facts merge and fight with socioculturally and politically hotly disputed topics with a critical and as well as admiring look on the elements of pop culture. Thordis is a founding member of the Berlin based female music producer collective „minutektiv” and is receiving a Master of Arts in Performance Studies at the University of Hamburg. Thordis artistic work in 2017: un*plug::myheart (NAKT Festival), Yes, I am Norman (PSi #23 OverFlow Konferenz, Kampnagel), Pina meets Peaches (Dance Future 2 Fokus Pina Bausch, Kampnagel). Bei diesem Ableton User Group Berlin Treffen geht es um die Verbindung und Interaktion von Musik, Tanz und gesprochenem Wort. Thordis Meyer, Mila Chiral und Donna Maya präsentieren unterschiedliche künstlerische Ansätze und Konzepte, und zeigen die konkrete Umsetzung dessen auch unter Einbeziehung von Ableton Live. Anschließend performen Mila Chiral und Donna Maya einen Auszug aus ihrer Arbeiten “Blickfang / Blick-Fänger” und Thordis Meyer stellt ihre Performance “Jetzt oder wie? !” live vor. Das Stück navigiert zwischen der Präsenz des Gedichts „Sphinx hinter Gittern“ von Anne Duden, den Interventionen von Donna Maya mit dem Theremin und elektronischen Klangkompositionen, verwoben mit Sprach-Samples, und dem choreographischen Changieren zwischen Räumen und Zeiten von Anja Weber aka Mila Chiral. Die Künstlerinnen arbeiten mit verschiedenen Medien auf unterschiedlichen Frequenzen. Sie schaffen ein Wechselspiel von sich abgrenzenden Rhythmen und Bildern – inkongruent doch koexistierend wie zeitgenössische urbane Landschaften in archaischen Vibrationen. “Blickfang / Blick-Fänger” wurde im Rahmen für drei D poesie im Auftrag für das Haus der Poesie, Berlin produziert.